Elise Melendez is a Chicago-based arts entrepreneur, dance educator and nonprofit marketer. As co-founder and executive director of Motivated Movers NYC, Elise cultivates a community for professional artists seeking beginner dance training. She also serves as marketing manager for the American Marketing Association, a global community dedicated to elevating the individual marketer. With a bachelor’s in American Dance Pedagogy from Oklahoma City University and a master’s in Arts, Entertainment, and Media Management from Columbia College Chicago, Elise has over a decade of experience in arts education and management. Her past roles include casting director and assistant to the artistic director at Hangar Theatre; client services account executive for Prevail Strategic Marketing & Communications; strategic planning consultant for NPH USA, Chicago Woman magazine and World Future Society; and development consultant for Chicago Youth Shakespeare. 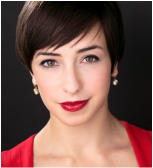 Elise has also been a guest teaching artist/choreographer for arts organizations and educational institutions such as Hangar Theatre, Palace Theatre New Hampshire, Lyric Theatre of Oklahoma, Applause, St. Norbert College and Oklahoma City University. Prior credits: Marketing and Publicity Assistant at Sacramento Music Circus, Executive Assistant at Finger Lakes Musical Theatre Festival / Merry-Go-Round Playhouse under the artistic direction of Brett Smock. Executive Assistant at NAMCO, currently producing Chicago and Waitress in New York and on tour. Currently, Junior Booking Agent at CAMI Music. The DTDC Artistic Associates are a group of individuals from various theatrical disciplines who act as a brain collective for the company. They meet with the Artistic Director once a month to discuss current projects, future plans, logistical problem solving and creative feedback. We also invite these Associates into the development process very early on so that they can have input on the development of the piece as well as start formulating creative ideas for future productions. ​Sara is a choreographer, director, educator and performer. Choreographer: Kicking & Screaming, Newton’s Cradle, Doug, Rock of Ages, Man of La Mancha, the Full Monty, Big Fish, Chicago, Ring of Fire, Merrily We Roll Along, Anyone Can Whistle, Pippin, Houdini, It Could Be. Broadway Resident & Assoc. Choreographer: Matilda, Billy Elliot, White Christmas, The Terms of My Surrender, After the Night and the Music, City Center Encores! : Gentlemen Prefer Blondes, Face the Music, Of Thee I Sing. Regional Assoc. Choreographer: An American In Paris, Broadway: 3 Generations, Lone Star Love, Show Boat, Pulse & concerts at NYC Town, The 92nd Street Y & Merkin Hall. Teaching: Banff Centre, Pace University & more. Dustin is a New York City-based Costume Designer. Spamilton: An American Parody (Off Broadway, Chicago, Los Angeles), Off Broadway: The Other Josh Cohen, Hell’s Belles, Greed: A Musical for Our Time, Forbidden Broadway: Comes Out Swinging, SPANDEX The Musical, Zelda at the Oasis, Cougar the Musical, Him. Regional: From Here to Eternity, West Side Story, Fairy Tale Christmas (Premiere), Prince of Egypt. Rachel is the artistic director of At the Table podcast, a play-reading incubator from Charging Moose Media. She studied directing at the A.R.T. under Robert Woodruff and Marcus Stern, and directed the Boston debut of Martin Sherman's Bent starring Jack Cutmore-Scott. Upcoming work includes the world premiere of Dust and Shadow: Sherlock Holmes and the Ripper Killings. As an actress, she originated the role of Stoner Chick in Heathers, the Musical (New World Stages), and appeared in Stop the Virgins at St. Ann’s Warehouse and Baby No More at The Kniting Factory. Harvard grad. Grace is a scenic designer for theater and opera based in New York City. Her work has recently been seen at Bard Music Festival (Halka, 2017), Juilliard (La Finta Giardiniera, 2017; Die Zauberflöte, 2016), Pacific Symphony (Aida, 2017), Boston Baroque (Giulio Cesare, 2017), and Dixon Place (The Whole Truth/The Cask of Amontillado, 2016). In the past year she has also collaborated with Walt Disney Creative Entertainment, the Peabody-Essex Museum in Salem, MA, and as an associate designer at the Roundabout and Huntington Theater Companies. Named a “Young Designer to Watch” by Live Design Magazine in 2015, Grace has worked as an associate and assistant set designer on and off-Broadway, regionally and internationally, with artists such as Derek McLane, Es Devlin, and Soutra Gilmour.She has a regular collaborative partnership with director Mary Birnbaum and designer Anshuman Bhatia. With them, along with Moria Clinton and Adam Cates, she was a winner of the 2015 Robert L.B. Tobin Director Designer Showcase, sponsored by Opera America. She presented a design for Gertrude Stein and Virgil Thompsons “4 Saints in 3 Acts” at Opera Conference 2015 in Washington, D.C. Grace holds an MA with Distinction from Central Saint Martins College of Art and Design in London, and a BA in Visual and Environmental Studies from Harvard College. ​Olivia is a New York City based theater artist and motion graphics designer. Joy is a writer and installation artist based in Queens, NY. Her writing experience crosses many platforms from playwriting to scripted short form documentaries. Her plays have been performed in the US, Cuba, and Germany. She’s also created several site-specific interactive installations for New York City festivals and galleries that invite and prompt audience participation with personal, historical and/or environmental perspectives. Joy has scripted media interactives and videos for Batwin + Robin Productions on projects including: The New York Historical Society in New York City; The Center for Civil and Human Rights in Atlanta, Georgia; King Abdulaziz Center for World Culture in Saudi Arabia; the North Carolina Museum of Natural Sciences; the Chickasaw Cultural Center in Ada, Oklahoma and the Heard Museum in Phoenix, Arizona. For six years, she worked both on and off-Broadway for the Public Theater as an Assistant to the Producer/Director, George C. Wolfe. She also previously worked on the Peabody winning series: Beckett on Film for Thirteen/WNET. Joy is a former Jerome Fellow, MacDowell Colony Fellow, AROHO Creative Artist Retreat Scholar, Women’s Project NYSCA Playwright-in-Residence, Gateway Middle School Playwright-in-Residence and LaGuardia Performing Arts Center Lab Resident Playwright. Joy's participated in workshops on genocide studies and how art can contribute to the process of reconciliation in theaters in Serbia, Rwanda and Uganda. MFA: California Institute of the Arts.